Noise applies speckles to the render. The noise color can be modulated by the Color setting located at the right of the Blend mode. Blur fuzzes the rendered details. The Color setting has no impact on this filter. This filter is the opposite of the Sharpen filter and so if the Strength slider is set to a negative value this filter will produce a Sharpen effect. Sharpen makes the edges and other details in the render more pronounced. This filter is the opposite of the Blur filter and so if the Strength slider is set to a negative value this filter will produce a Blur effect. Orton produces a popular photographic effect that superimposes a blurred version of the image with a sharpened version. The result is a soft and slightly blurry image that nonetheless has clear details and vibrant color. Glow applies a glow effect to the render. The color of the Glow is based on the render color. The Displace filter will create a noise-type deformation. The Displace slider will affect how wide the noise is, meaning how many pixels are displaced from their original position. The Radius modifier slider will affect the size of the noise itself. Using a negative or positive value for the Displace slider will produce a similar effect, but via a different algorithm. When searching for a specific style, don’t forget to try both positive and negative values. This filter is great for altering the outline edges of the model, creating a style that is more like a pencil than computer graphics. On the left, the original render. On the right, the Displace filter has been applied. Notice the lines and shading deformations. Fade applies transparency to the render. At 100%, the rendered colors become invisible. Colorize applies a uniform color to the render which can be modulated by the Color setting located at the right of the Blend mode. This filter is applied using the Replace blending mode. Red applies a uniform red color to the render using the Screen blending mode. The Color setting has no impact on this filter. Green applies a uniform green color to the render using the Screen blending mode. The Color setting has no impact on this filter. 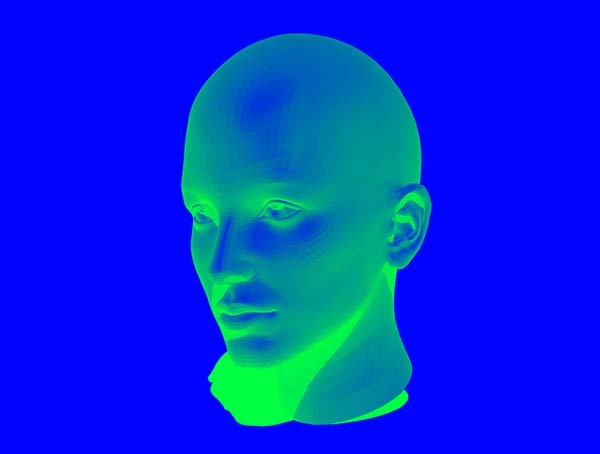 Blue applies a uniform blue color to the render using the Screen blending mode. The Color setting has no impact on this filter. Saturation modifies the color purity within the render. (Red at 100% saturation is pure red while at 0% saturation is colorless gray.) The Color setting has no impact on this filter. Hue shifts the colors within the render to a different color. How far the color is shifted away from its starting point is modified by the Strength slider. The Color setting has no impact on this filter. Intensity modifies how bright the colors are within the render. A negative for the Strength slider will darken the render while a positive value will lighter the render. The Color setting has no impact on this filter. With the color patch set to mid-grey and a strength setting close to 1, the Negative filter adjusts your render to look more like a film negative. The Gamma filter applies an exponential of the color intensity. It lightens the overall image without washing out detail. Additive offsets all colors in the image to be brighter or darker by an equal amount. Paint applies the selected color from the patch over the BPR render. Combined with the Mask and Fresnel settings, it can produce non-photorealistic rendering (NPR). Contrast User Color allows you to modulate the contrast of the render using the Color information defined with the color patch available below the Strength slider. This color will be added with the colors from the final render. A darker color will create a much more contrasted render and lighter color will provide less contrast. For better results you can mix this contrast with the Mask modulator. Contrast Auto Color is similar to the Contrast User Color, but ZBrush will find the best color from the final render. Contrast Auto Gray is similar to the Contrast User Color, but the contrast will use a neutral grey. This results in a neutral colored contrast. The five Posterize filters apply a post-render posterize effect to the whole render, including any background image. XLow applies the least amount of posterization and XHigh the greatest amount of posterization. The Reflect Background filter will simulate a reflection the model and background in the floor. The Floor must be active for this filter to work. The Reflect Self filter will simulate a reflection of the model in the floor. The Floor must be active for this filter to work. The Render Composite filter is a renamed version of the Texture Overlay filter from earlier ZBrush versions. This filter has a texture modulator and when activated it will load (and store) the current rendering with its filters. An example of where this is useful is to blend the result of your current filter with another to create a composite render. This filter can also be used to generate multiple renders of a model in different views. You can save a first view then hide the render composite, changing the point of view before doing a new render. At this point, reenabling the previous render composite will blend both views together. The Render Composite filter in action. Notice the render stored in the Texture modulator, which can now be mixed with other filters. The Texture filter will apply a selected image (from the Texture slot under the Modifiers) on top of the current render. This image can be scaled up and down through the Texture slider and modifications can be applied in the Modifiers popup. For example, the Rotation of the texture and the Orientations Count slider will change the orientation of the overlaid texture based on the color intensity/shade of gray. This power of this filter comes from the operators which will clip the texture in mul­tiple ways, like applying the texture on only the shadow areas in your render or only to a specific range of shades on the model. The texture can be modified by using the Back and Front color swatches as well. These colors will replace the texture or alpha color, based on the intensity of the alpha or texture. On the left, the original render. On the right, the Texture filter has been applied with an alpha as a texture. The Texture Overlay filter will apply a selected image (from the Texture slot under the Modifiers) on top of the current render. This filter is very similar to the Texture filter except that it analyzes the texture inten­sity and then creates a bump effect based on the median intensity value. This filter will therefore work best with greyscale images. It’s a great filter to simulate pencil effects in your renders. This filter uses the same settings as the Texture filter. Please refer to the section above for more information. The same scene as the Texture filter illustration, except that on the right, the Texture Overlay filter has been used. Notice the difference in depth between each filter. Also, the Texture Overlay filter will have a higher contrast result. The Restore filter will bring back the original render without any previous filters being applied. This makes it possible to reuse parts of the original rendering results without any filters. You can apply this filter and clip the effect to only the cavities of the model or its shadows, with the effect of restoring only those specific areas. The Screendots: Pixel filter applies a dot-type noise on your render, with the dots each being one pixel in size. The positive and negative values of the filter will define whether the dominant color is defined by the Back Color or Front Color value. 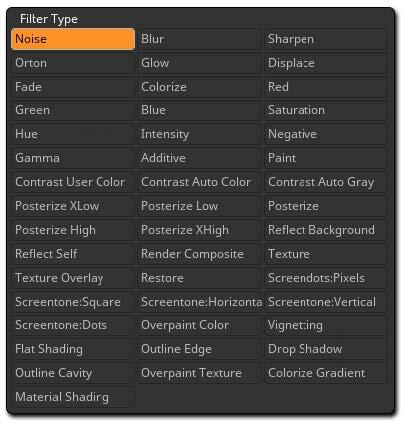 This filter is great for adding noise variations to a render. Pixels has been added to the model on the right. It has been modulated with the Fresnel setting, making the effect more apparent on the borders of the model and less on its font part. The Screentone:Square filter use the render’s luminance value to create a square pattern. The darker the original image, the larger the squares or dots will be. The Modifiers alter this default behavior by allowing you to use a constant size, change one of the colors or alter the effect’s transparency. 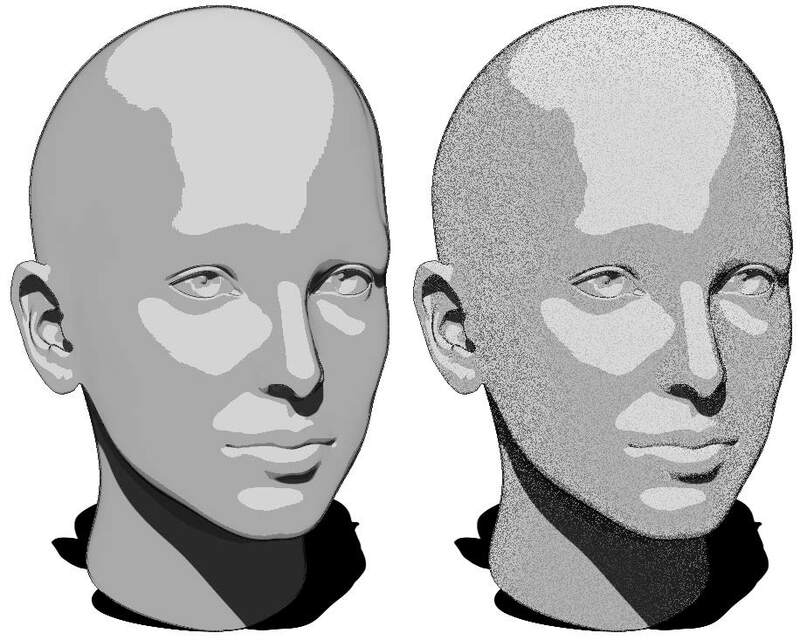 On the left, the original model followed by Screentone:Square and then Screentone:Dots applied, each one with different settings. The Screentone:Horizontal filter functions the same way as the Square and Dots version expect that it creates a lines pattern. By default, the thickness of the line will be affected by the render’s luminance value. Combining both Vertical and Horizontal filters can create a nice lattice pattern. The two filters with different settings. The Screentone:Vertical filter functions the same way as the Square and Dots version expect that it creates a lines pattern. By default, the thickness of the line will be affected by the render’s luminance value. Similar to Screentone:Square, the Screentone:Dots filter uses the render’s luminance value to create a dot pattern. The darker the original image, the larger the dots will be. OverPaint Color is a filter which will create a square base pattern from your image using the color intensity of each square. You can then apply multiple parameters to change the size and orientation of the squares and add variations to make it look natural. This filter can be used to make nice background patterns such as old paper. On the left, the original model. In the center, the Overpaint Color filter with mostly default settings. When modifying those settings as on the right, it can produce very interesting effects. In this case, one Overpaint Color filter was used for the background and another for the head. The Vignetting filter darkens the boundaries of the document. This effect is a very popular way to place the visual focus on the model. By tweaking the modifiers of the filter you will be able to change the center position, affect the softness of the effect and alter its color. On the right, the Vignetting filter in action. The Flat Shading filter produces a cell shading effect in your render. It can simulate the stepped curve effect that you can manually create in Materials as explained in the “Realtime NPR with Cell Shading and Outline Look” section above. This filter analyzes your render colors and will crops them to produce a number of shades defined by the same named slider in the Modifiers popup. Editing the Exponent value shifts the spread of shades toward the darker or lighter colors of the model. The Minimum and Maximum Intensity sliders will trim the minimum and maximum range for the model colors. The Colorize modifier will add a color tint to your flat shading, using the colors lo­cated in the Back and Front color pickers. Two different models, organic and hard surface. Each is shown both without and with the Flat Shading filter. The outline edge filter creates a line around the model’s silhouette and also any shapes that are prominent from the camera angle. 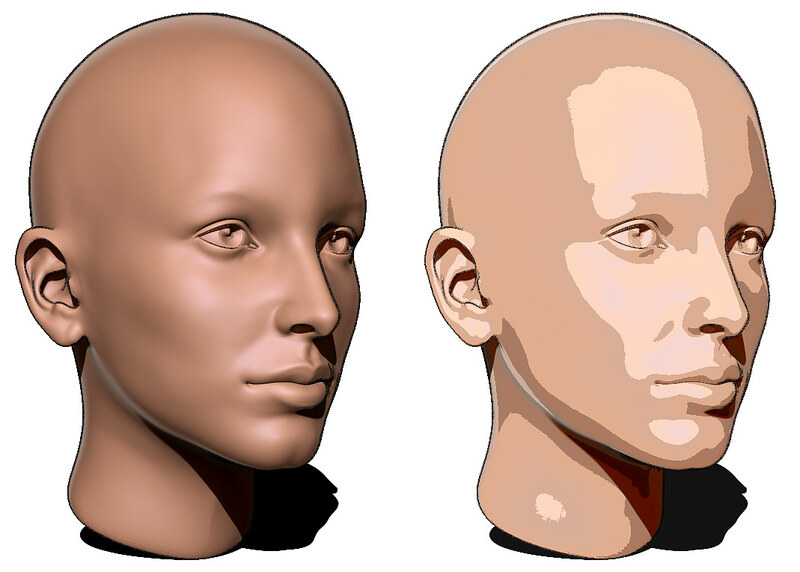 For example if we are rendering a human face, a line will be added around the entire boundary and also (depending on the camera angle) some parts of the nose. The modifiers let you define cavity detection. Outside cavities are the default but you can also change to inside cavity detection for the boundaries of internal extrusions. You can add noise to the outline, making it less “computer generated,” and change the Outline Falloff to modify the outline detection and affect its thickness. The main slider will affect the color and intensity of the outline, based on the Back and Front color swatches. The same model with the Flat Shading filter except that on the right, the Outline Edge filter has also been added which makes a strong visual difference in shape perception. The Drop Shadow filter creates a black copy of the current model which can be used as a black shadow. However, the copied image is by default on top of the render rather than behind. To create a true Drop Shadow, you need to use modulators such as Mask at a value of -1 to apply this filter to everything except the model. The Modifiers let you change the drop shadow position as well as flip it or changing its saturation and intensity. The Drop Shadow filter has been added on the model from the right. By default, the filter doesn’t provide a blur setting, but a Sharpen filter with a negative value was applied to everything but the model. The Outline Cavity filter is designed to create an outline to the model similar to the Outline Edge filter explained above, except that it uses a different detection algorithm and so provides different Modifiers. This filter is better than Outline Edge for detecting curvature of the surface on the model. The main slider affects the color and intensity of the outline, based on the Back and Front color swatches. The OverPaint Texture filter is the same as the Overpaint Color filter except that it will overlay a texture on the square shapes. Both filters share the same parameters. The Colorize Gradient filter will apply a gradient based on the Back Color and Front Color, according to the tones of the image. Adjust the Modifiers>Gamma slider to change the midpoint of the gradient. The Material Shading filter stores a material (which can include MatCaps) within the filter which can be used to provide base color and shading to your filters. This means that if you save your BPR filters through a RenderSet preset, you can be sure that your render will look the same on other models which don’t even have the same materials as a base. You need to click on the Texture selector below the Modifiers section to select the material to use with your filter.